With scorelines of 4 plus goals in all the other fixtures, a 0-1 defeat at home for Chelsea after 9 years by the title rivals may not seem to be as emphatic, but with a crucial away goal, the reds are favorites going home for the return leg. Sir Alex opted for a 4-4-2 similar to the last encounter with Chelsea. Hernandez spearheading attack, Park and Carrick in centre, with Giggs and Valencia on the flanks. Rio returned to first team action after 2 months. Carlo Ancelotti played a similar 4-4-2 with surprise omission of both Anelka and Malouda, starting Zhirkov on the flank and Torres pairing with Drogba. A few stray passes here and there, with a nervous start from both sides. There was no frenetic pace as the game began. A studs up tackle by Essien on Rooney as early as 5 min was not picked up by the ref and that set the tone to the manner in which Ref Mallenco was gonna let the play go on as far as possible. United slowly grew into a rhythm with Carrick orchestrating the midfield well. It took 25 min when a lovely long diagonal from Carrick picked Ryan Giggs on the left, who found Wayne Rooney making a late dash to the edge of the box to side foot the ball off the inside of the far post into the goal. The celebration was a total anticlimax – A smiling Rooney takes a tumble on the turf, points skyward and embracing his compatriots [The Mail will be disappointed that it is an orthodox goal celebration]. So much for all the hoo – haa over the ‘F’ word. At the other end, Drogba was finding it difficult to get beyond first touches. 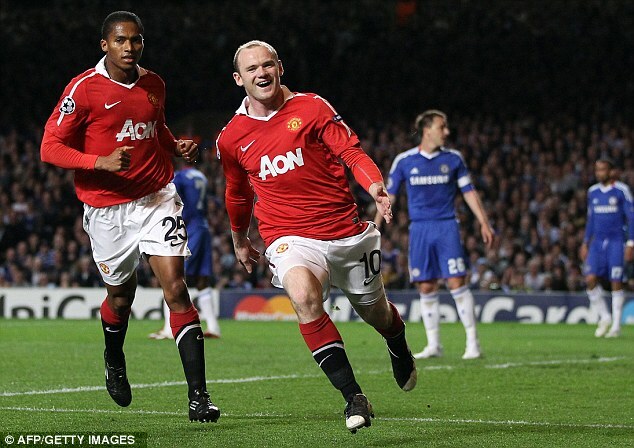 He was well marshalled by Evra and Vidic. Torres on the other hand was fairly successful in slithering this way and that way but his spiteful form continues. An attempted overhead kick was completely mistimed and failed to make more of a one on one with Vidic. His attempt to draw a penalty with a simulation went in vain but was very fortunate not to get booked, though Rio did give him a piece of his mind. The best opportunity for Chelsea came in the dying moments of the half when a Lampard shot destined for the net was cleared in front of goal by Evra. There was not much to choose from both teams at half time but clearly the form of the United front men the difference in the scoreline. I was disappointed that Malouda and Anelka did not start, anticipated a change at least at half time. Instead none happened. In the backdrop of how Chelsea bounced back last game, Ancelotti must have rallied the troops in a similar manner cause it took only 5 min for Drogba to whip in a brilliant ball into the box, where a sprinting Ramires missed from 5 yards – an open header. As glaring opportunities like this were being missed, one had to wonder if Chelsea will rue it. Carrick was outstanding in the middle of the park! Rafael departed in the first ten min with a body check on Drogba resulting in a knee injury. Sir Alex took a bold move in bringing Nani on and shifting Valencia to RB and boy did he revel. At the weekend we saw Ryan Giggs marshalling LB and yesterday Valencia. He did not disappoint one bit and was the most threatening full back in the second half. Rooney and Chicharito’s dogged determination to track back and make life uncomfortable for both ramires and essien bore fruit with Giggs and Park having their work simplified. A 70min substitution [Drogba, Zhirkov] – a little too late IMO, brought Malouda and Anelka. Chelsea reverted to a more familiar 4-3-3 and all of a sudden van der sar was the busiest of all United players. Pulled off a brilliant save on the stretch to deny Torres a well placed header. He seems to have done his hamstring a bit in that save and took no part in any further goal kicks. United were nervy and edgy towards the end with last ditch clearances; but with a lacklustre Chelsea forward force, never really threatened to score. I felt Ramires was brilliant in the second half making a multitude of ‘Lampardish’ runs into the box. His second chance was when Evra mistimed his tackle [and my first reaction – penalty] though on seeing replays looked like the contact was just outside the box. None of the referees spotted the penalty claims and United were let off the hook. A second simulation wherein Torres intentionally makes contact with Valencia to go down in the box earned him a well deserved yellow. IMO, Carlo was wrong to play such an out of form forward just because his track record is good against united. Drogba was peaking, and Anelka has been brilliant in Europe. There should have been no second thoughts. Torres could have been introduced in the second half if the other two weren’t performing. Chelsea had zero width in attack, couple of those rare moments when Bosingwa did manage to get past Evra, he disappointed with the crosses. Lampard’s 500th seemed like he wasn’t around mainly because he was not playing his favorite position. Rooney was simply outstanding covering lots of ground, helping out in midfield and defence, creative passing, complete package with his finishing. Carrick impressed with his whole repertoire of passing; Valencia showed his adapatability; Rio’s return invariably means a clean sheet. Chicharito, Park – exemplary work rates. I still consider Torres to be my favorite striker for the ability he possesses. The longer his barren spell continues, the less favorite he will be to Carlo and the fans. The only thing he seems to be learning at training there is from his buddy Drogba and the art of diving. Despicable and shameful! Manchester United are firm favorites to win this time with the away goal in their locker. Carlo’s questionable comments on the refereeing probably will never seek any reprimand. After all he is not a United coach! Next Post Happy New Year to one and all! dude this is taking it too far dont you think?? “Carlo’s questionable comments on the refereeing probably will never seek any reprimand. After all he is not a United coach!” Arsene wenger has a european suspension. Jose mourniho had one.. stop Victimizing urself. I have my reason to be aggrieved my friend. Rules are rules. FA or UEFA. Their inconsistency is something we are all aware of. If you feel this is overboard – I would like you to read his post match comment on the ref and tell me, what exactly you infer. If we have a difference in opinion, THEN we will discuss victimizing! ok just read your comment. I am in office rite now so wil check what carlo said later. But i was referring to “After all he is not a United coach”.